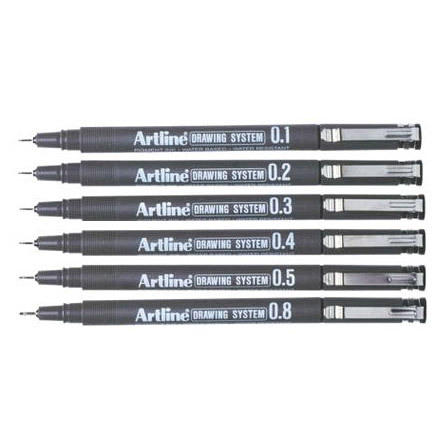 Artline Tech Drawing Pens are xylene free. Disposable Technical Drawing Pens The acid free, water based pigment ink in the Artline Technical Drawing pens is water resistant and fade proof. 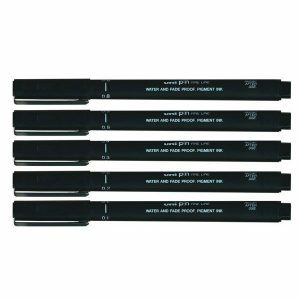 The metal ferrule is ideal for template and ruling work making this range ideal for all general writing drawing and technical drawing Available in sizes 0.1mm, 0.2mm, 0.3mm, 0.4mm, 0.5mm, 0.8mm. 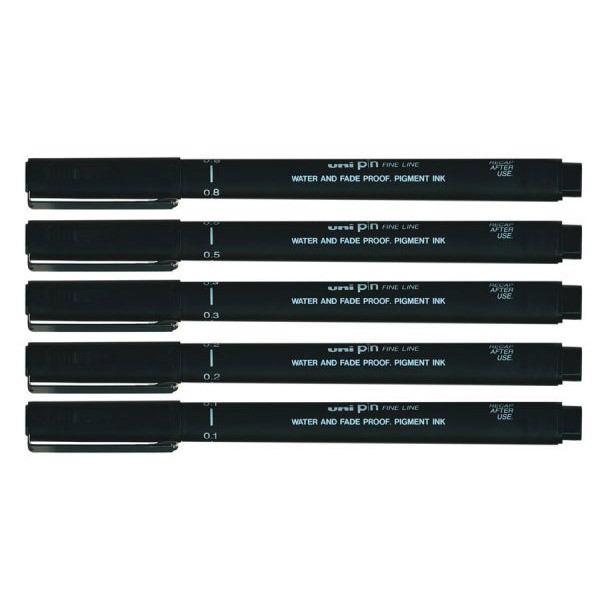 Also in a set of 6 (0.1mm, 0.2mm, 0.3mm, 0.4mm, 0.5mm, 0.8mm) Facts: Pigment Ink To easiest way to think of Pigment Ink is to liken it to paint. 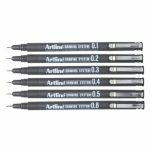 Artline Tech Drawing Pens are xylene free. 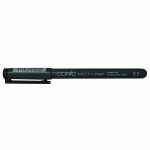 Disposable Technical Drawing Pens The acid free, water based pigment ink in the Artline Technical Drawing pens is water resistant and fade proof. 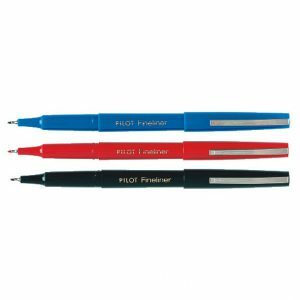 The metal ferrule is ideal for template and ruling work making this range ideal for all general writing drawing and technical drawing Available in sizes 0.1mm, 0.2mm, 0.3mm, 0.4mm, 0.5mm, 0.8mm. 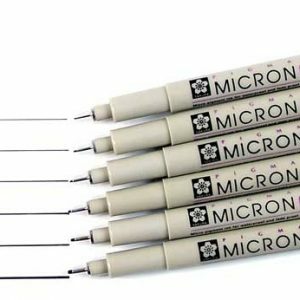 Also in a set of 6 (0.1mm, 0.2mm, 0.3mm, 0.4mm, 0.5mm, 0.8mm) Facts: Pigment Ink To easiest way to think of Pigment Ink is to liken it to paint. 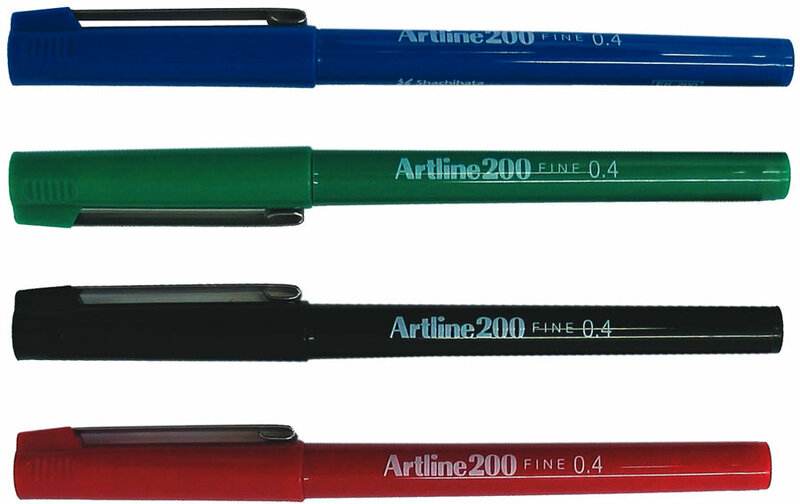 When you use any Artline product with Pigment Ink, the marking is solid and retains its colour no matter what surface you are writing on. In addition, Pigment Ink is more resistant of fading and water damage. Using a Poster Marker with Pigment Ink on glass Pigment Inks always retain their colour no matter what type of surface you’re writing on. 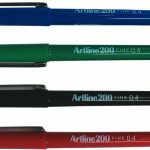 Artline 200 is a General Purpose Fineliner The instant drying, blur proof ink in the Artline 200 makes the plastic tip pen ideal for all general writing and drawing in the office, home or school. 0.4mm felt tip pen. Xylene Free. Available in Black, Blue, Red, Green Also available in a box of 12 one colour. 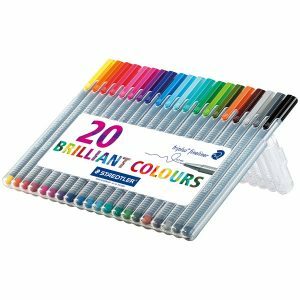 Staedtler Triplus Colour Fineliners Fineliner with superfine, metal-clad tip Slim, triangular-barrel pens ergonomically designed for comfortable drawing and writing. 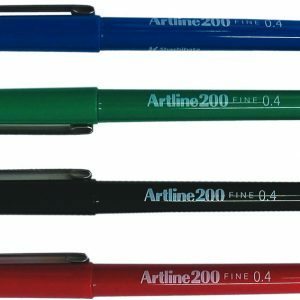 Unipin Fineliners feature a super tough writing tip an ultra smooth flow of waterproof,fadeproof ink. Available in 5 tip sizes. 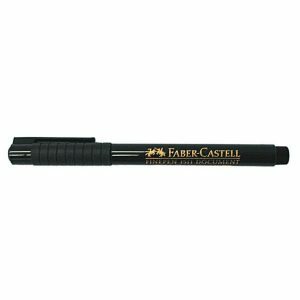 An economical replacement to a technical pen it has a hard wearing plastic tip. Sizes available 0.1mm, 0.2mm, 0.3mm, 0.5mm, 0.8mm. Black only. 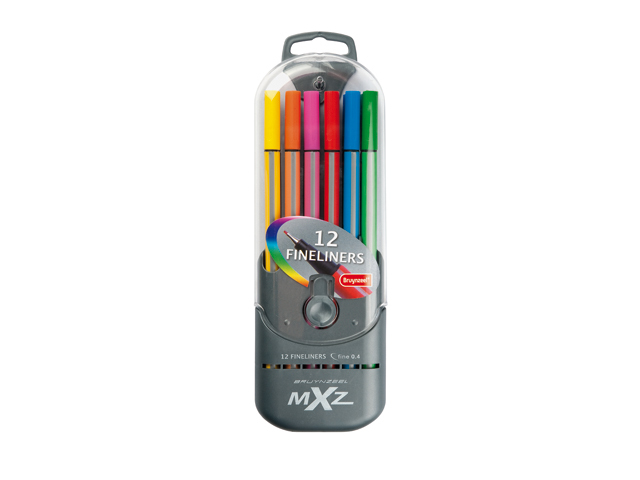 Available in singles Boxes of 12 one size Set of 5: 0.1mm, 0.2mm, 0.3mm, 0.5mm, 0.8mm in a plastic wallet. 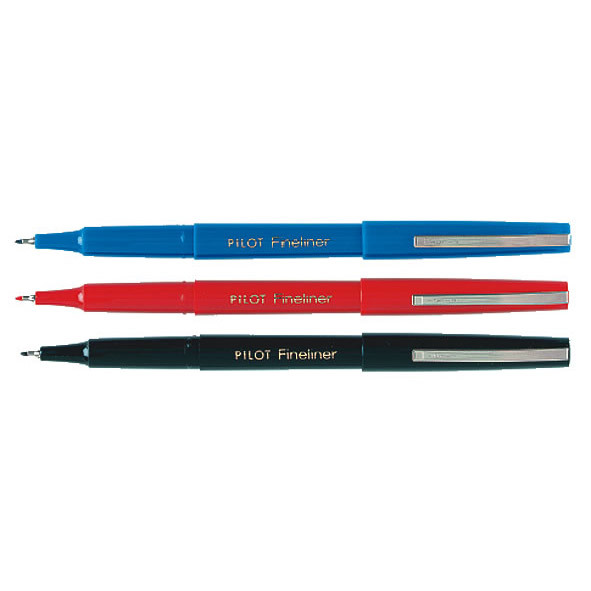 The Pilot Fineliner - Waterbased 0.4mm tip that can be used for any line work. Available in black, blue, red, green, in singles or boxes of 12. 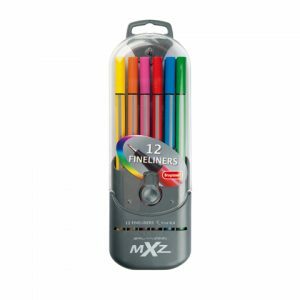 Available in a set of 8: 2 x black, 2 x blue, 2 x red, 1 x green, 1 x purple The original and best permanent marker for paper and cardboard. 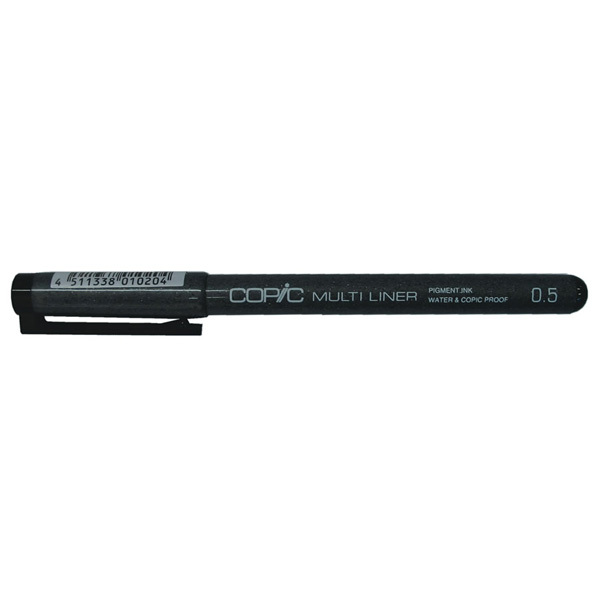 Perfect for precise lines and writing through carbon copies. Durable hard plastic mounted tip.